This week's theme is: YELLOW! Yes...Yellow! It's just such a happy color! See....didn't that bright yellow sun just make ya smile. This week's theme is: WORDS! Words on quilts, words on projects, words on signs. Search your archives for those wordy projects! I'm going to rejuvenate my "trunk load of word quilts" but also wanted to share one of my stairways that is happily decorated with many of these quilts. I had a twenty-five dollar coupon and have recently treated myself to Lori Holt's new Spelling Bee book and now have a few more "wordy" quilts in the planning phase that will make a fun addition to this gallery of quilts. I'm glad to have Tuesday Archives back and as always, look forward to what your have to rejuvenate for your archives for this week's theme! 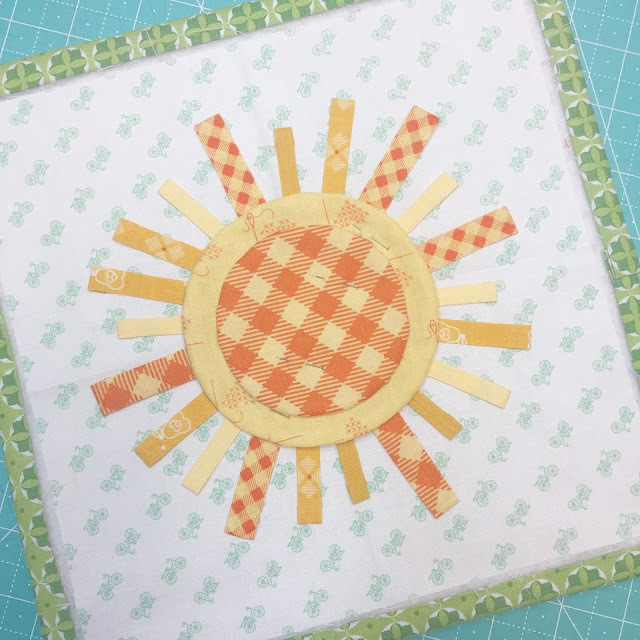 Summary: Join and experience creativity and nostalgia through Grace, a master quilter, -as she shares her creative gifts with her young granddaughter, Audrey. Together their lives unfold around their family quilt. The love between grandmother and granddaughter keep a family’s generations turning despite minor setbacks, disappointments and celebrations of life. As friends and family of this charming mountain town in Colorado come together for life’s moments. Creating an inspirational, heartwarming story to share with those you love. 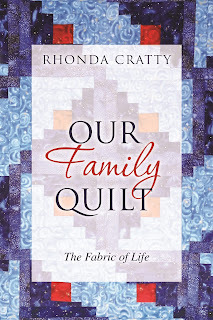 I was flattered and happy when author Rhonda Cratty, sent me a copy of her book, The Family Quilt for me to read and offer as a give-away here on my blog. I'm enjoying this book in-between quilting my "monster" ragged roses/nine patch quilt. (Which your guys, is almost done!!!) After a few e-mail correspondences between us, it was fun to get to know Rhonda and learn about her path to quilting and how much we have in common. She lives in beautiful Colorado and like me, enjoys walking, hiking, and cross country skiing. And like many of us quilters, when she is not writing, she enjoys traveling, quilting, crocheting, cooking, reading and painting. As I read, though I don't have family nearby, or any granddaughters, I love the idea how quilting connects people. Like you and I. And lately, it's so wierd, but I have been asked why I quilt. What do I do with all my quilts. Why don't I just sell them. 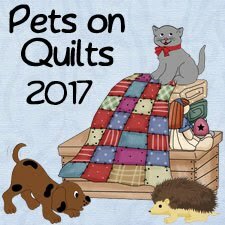 I even been kinda laughed at for having a dozen (okay more) quilts just piled around my house and that even the dogs have a quilt! They gasp...while I'm internally thinking: "Of course they do! LOL!" I hate when I don't have a quick answer....I always find myself contemplating others views and comments rather than having a quick response. Hmmm....more often than not, I do ask myself those very questions. Am I evolving into a lonely, old quilt lady? Why do I do what I do? 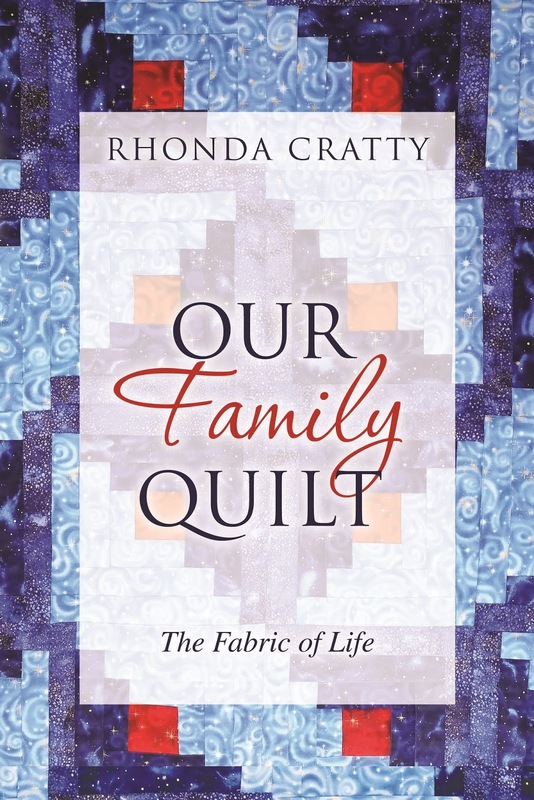 While reading Rhonda's book I'm intriqued how writing Our Family Quilt began as a book idea but then moved her into research of quilting as an art form in America. The characters in this book evolved through quilting classes, quilting shows, museums, shops, the Columbine Quilt Guild, inspiring speakers, and encouraging quilters. 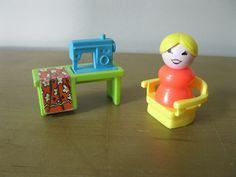 Each experience inspired the Rhonda to add a different dimension to both her quilting and writing. Like Rhonda and I'm sure many of you, I find the quilting process moves me forward and inspires my NEED to be creative. It adds that different dimension to my life that I like. I value the quiet time it provides me to recharge. It's a way I take care of myself....a healthy outlet during times I may feel lonely or sad from life's challenges. But it also allows outlet to my creativity. I love that I can create original gifts for others. I can give to charities. It allows me to continuously grow and learn. 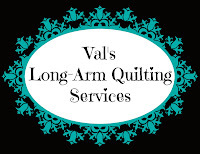 Example, while quilting the "monster" I have gained a new confidence in my quilting and with that, took a pile of business cards to my favorite quilt shop for distribution. Out of the blue...while rhythmically quilting those 99 blocks, a brand new idea has been formulating in my mind. Each day I have found myself enthusiastically capturing those ideas in my sketchbook for later reference. I'm learning that confidence comes from doing something you thought you couldn't do. Inspiration comes from sources we don't predict. That's why I quilt. As Rhonda's book so wonderfully interweaves throughout her story it's the value of living a creative life quilting allows. Keep an eye out as I continue my series of "Creativity" posts. Coming up soon: Being Prepared followed by Making Time . This finish measures 62"x 72". Yes I broke all the rules and did a Daisy on a String pantograph on this applique quilt...and I love it! This is a loose pattern that didn't take away from the applique. I think that was the key. Another happy finish that was a great stash buster.